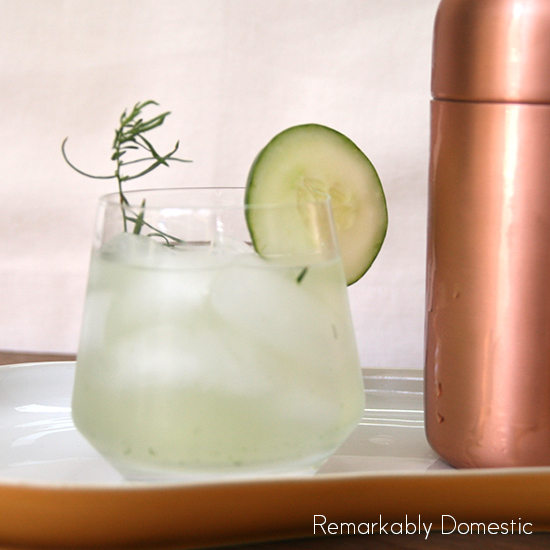 Cucumber Tarragon Gin & Tonic, and a GIVEAWAY! 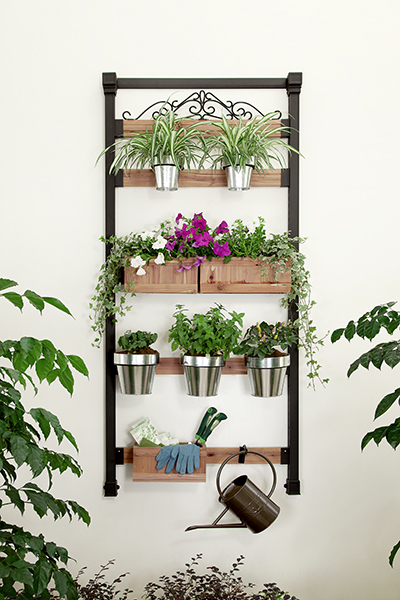 Pennington makes modular vertical gardening systems that are completely customizable so that you can fit them into your space. Awesome, right? Obviously, they are vertical, so you can grow upwards instead of outwards. Which means that no matter how much space you have, you can install a garden. I’m excited to try the system that Pennington has provided for me, and you’ll get more deets on that next week! One thing I love growing in my garden is herbs. They are so easy, and beautiful, and useful. You’ve seen my single herb basil garden before, and this year I planted an ecclectic bunch of herbs. Truthfully, the reason I wanted so many different herbs was for cocktails. But I swear, I’m not a lush. Now that the garden is growing like mad, it’s time to cash in, so to speak, on the herbal bounty. I’m starting off with a refreshing, delicious cocktail: Cucumber Tarragon Gin & Tonic. Now, even if you don’t like Gin & Tonic, I suggest to you that you’ll like this cocktail. It’s great for everyone because it’s not too sweet and not too bitter. And refreshing? Gah, you will not believe it. 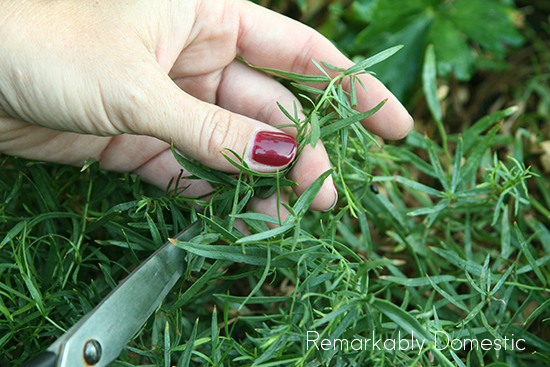 First, you have to get yourself some tarragon, and hopefully you’ll be able to step out your door and pick some fresh. Nothing like an herb that was actually still growing 90 seconds before you consume it. Snip off two or three sprigs. 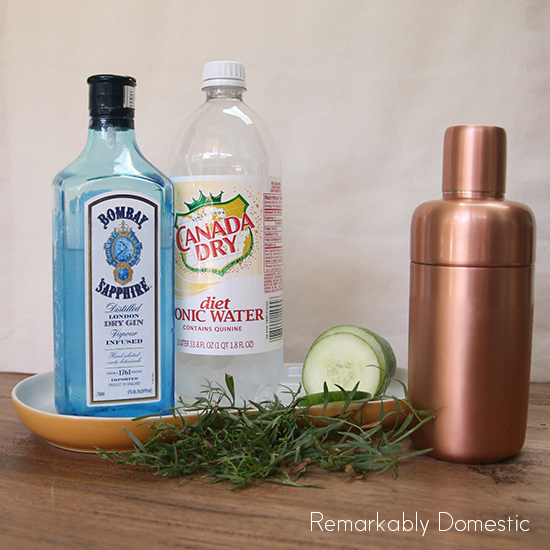 First, put your sprigs of tarragon into your cocktail shaker. I always pull the leaves off and leave the stems out. Next, add two thick slices of cucumber. 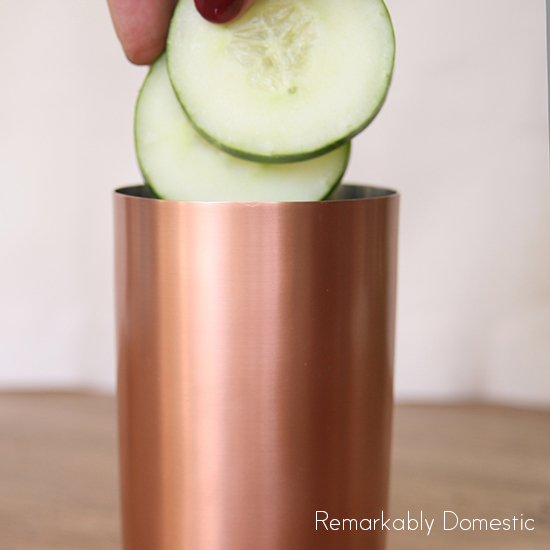 If you want a slightly stronger cucumber taste, you can cut these slices into quarters. 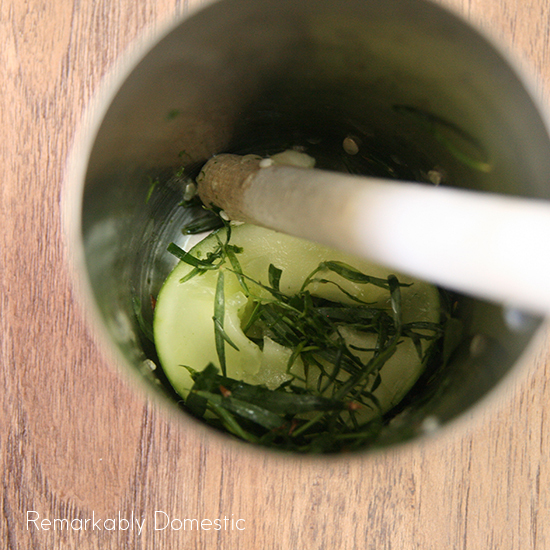 Using the end of a wooden spoon, or a muddler if you own one, smash up the cucumber and the tarragon. “Smash” is the technical term, but some people like to say “muddle.” Those people are too cool for school. You’ll notice that, if you’ve used the slices intact, you’re really only getting the center of the cucumber mushed up. Which is fine. If you cut your cucumber up, you’ll be able to smash the rind as well, and you’ll get more of a cucumber taste. Dealer’s choice! Now, fill your shaker with ice. To the top. No skimping! Then, add your gin. You want to fill the shaker about 1/3 full. Now add your tonic. 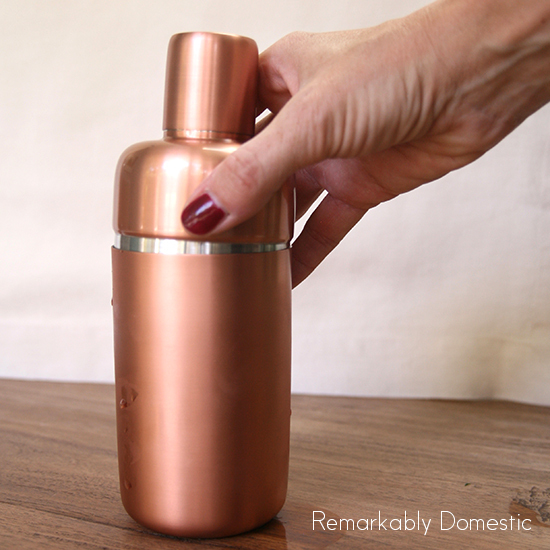 Fill the shaker up, which will end up being 2/3 of the shaker in tonic. Put the lid on and shake it like a Polaroid picture. 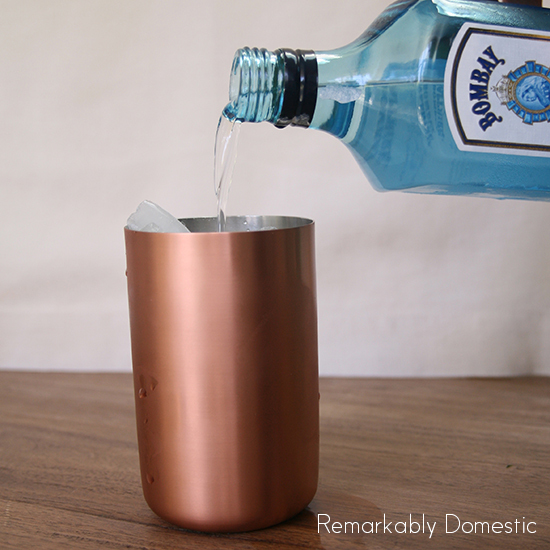 Pour through the strainer into a glass full of ice. 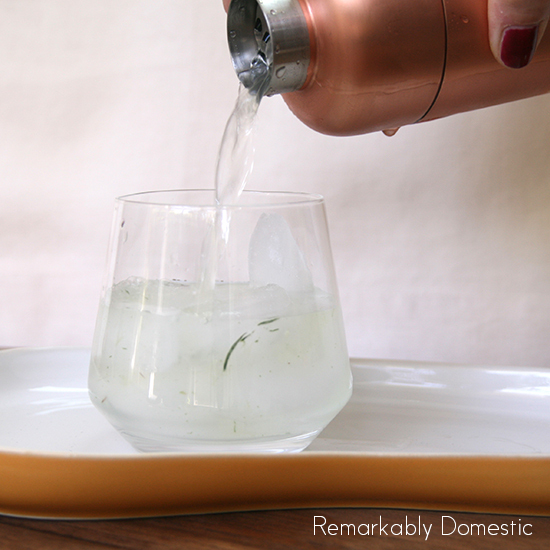 You will still get some tarragon bits (depending on how wild you went with the smashing), so if you want a completely clear drink, you can pour through a strainer to eliminate those herb bits. I kind of like them floating in there. 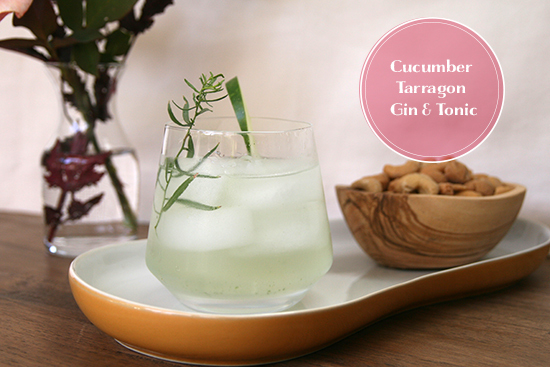 Garnish with tarragon and a slice of cucumber! And enjoy! Check in next week when I’ll have another herbal cocktail to share with you. Disclaimer: This post was sponsored by Pennington Vertical Gardens, but the entirety of the content of my post is my own. Pennington Vertical Gardens partnered with bloggers such as me to help educate us all about their Pennington Vertical Gardening System products. As part of this program, I received compensation. They did not tell me what to purchase or what to say about the use of the products. Pennington Vertical Gardens believes that consumers and bloggers are free to form their own opinions and share them in their own words. Pennington Vertical Garden’s policies align with WOMMA Ethics Code, FTC guidelines and social media engagement recommendations. A winner will be chosen by random and gift card fulfillment will be handled by a third party. I don’t have any gardening tips other than marry someone who likes to garden! We have fresh herbs all the time and could really use a vertical garden in our small backyard. Also? I really need that cocktail to make back-to-school night more interesting this evening. We have back to school night tonight, too! You know I’m gonna be loading up. Transplant in the spring or fall for the highest plant survival rates! I don’t really have any gardening tips, but tomatoes were my favorite things to grow this year. I used them so often, from making fresh salsa, to just putting slices on top of my grilled burgers. Tomatoes are the BEST fresh from the garden. And nothing beats tomato sauce made with home-grown tomatoes. 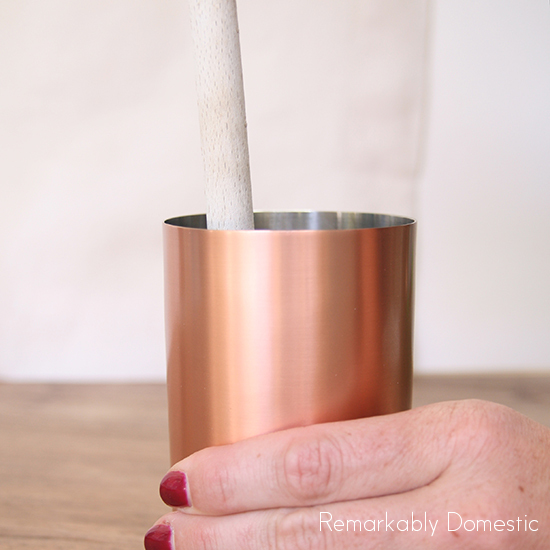 The vertical growers are awesome and I am obsessed with your copper cocktail shaker!! 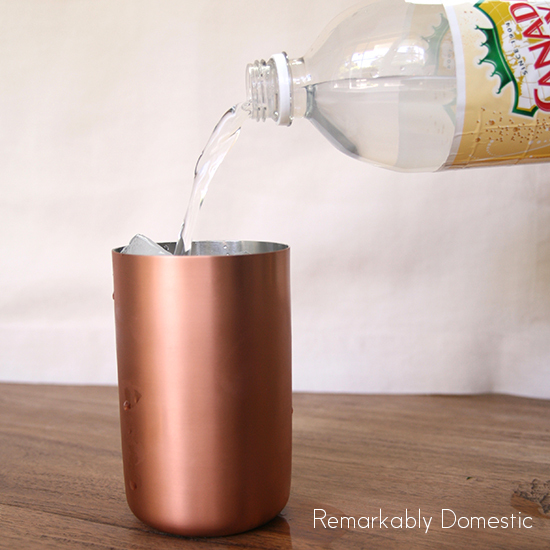 Something that I’ve really been into lately is Moscow Mules. Such a simple cocktail with vodka lime juice and ginger beer but extremely refreshing! 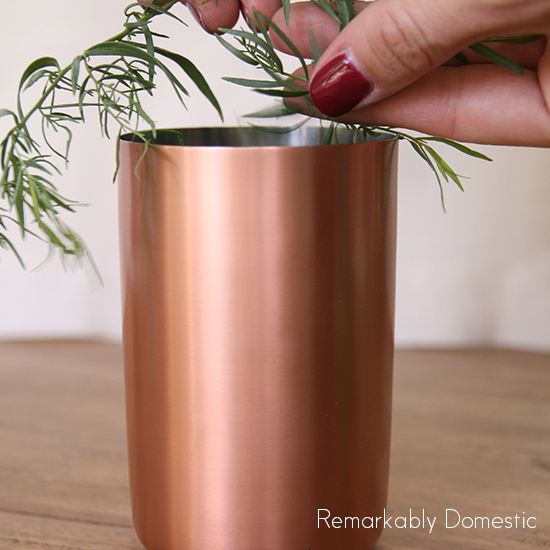 On my wish list are some copper mugs that they are traditionally served in. Isn’t that the coolest shaker?! Crate & Barrel!!! I just stumbled on it & had to have it. There’s a whole line of cool cocktail stuff there right now. Basil, and Thyme. Basil for the Caprese salad and thyme because if you simply rub a pork loin with olive oil, salt and pepper and place a few sprigs of thyme on it,(thank you Rachael Ray) bake at 450 for like 2O min, it is sooooo delicious but totally doesn’t taste good without the thyme. My tip is not to take gardening advice from me! I have had good luck with herbs in pots though. It’s easy to do and you can save a ton of money because you don’t have to buy those little packages of herbs at the grocery store. I wish I had fresh tarragon for this drink recipe! I have heard that you should crush egg shells in the garden to keep slugs away. My favorite thing to grow in my garden is tomatoes in the summer. To conserve water and protect top soil, use mulch over soil beds, I use it everywhere. I REALLY want to hear about the vertical garden — being challenged by a lack of outdoor space, I don’t really garden. But I would love to grow some basil, rosemary, and other herbs (and since I have a nice new bottle of gin, I’m going to have to try your yummy-sounding recipe, just with store-bought herbs … !). September 29, 2013, 8:39 pm Jessie C.
My tip is to start with lower maintenance perennials. New to gardening, but I have learned never to quickly give up on plants. A little more sun/water can revive some plants you might thought were gone. I love growing my own veggies. Each year I make my own salsa to enjoy all winter. I also add it to my homemade soups. My favorite thing to grow is strawberries…tip – I do them in pots in a cage otherwise the squirrels get them all. This cocktail looks great, can’t wait to try it!